Bold lines and bright colors jump off the walls at Gonzaga's Jundt Art Museum to tell the 60-year story of American pop art in the museum's newest exhibit From the Collection: Pop! And Beyond. The Jundt's new exhibit brilliantly captures the spirit of the 1960s and 1970s with its plethora of artists and more than 60 pieces from its permanent collection. 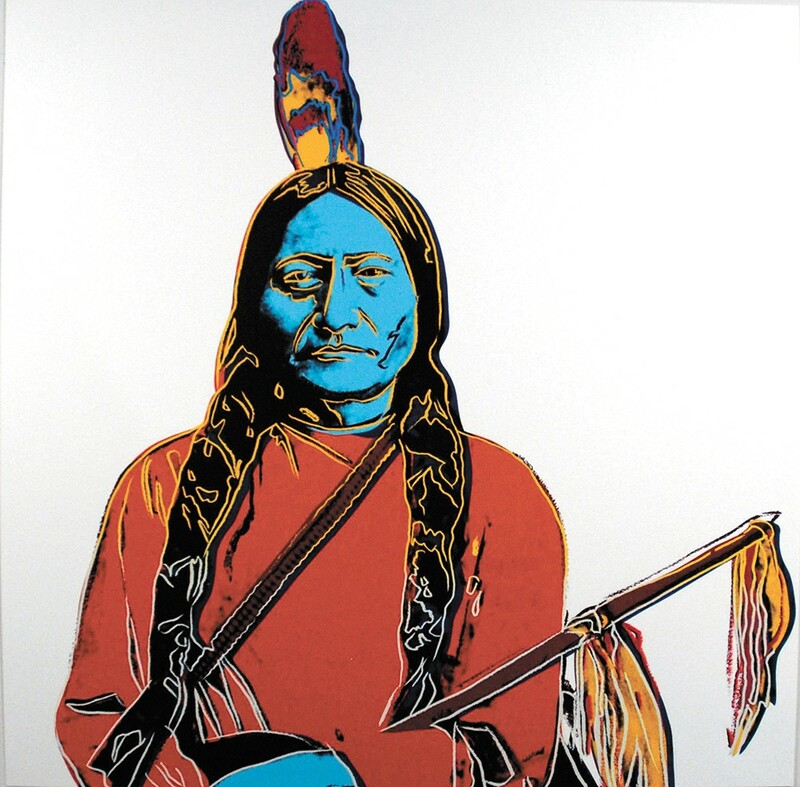 The show, at the museum through May 12, showcases pieces using the prolific screen printing and lithograph methods. The use of bold lines, primary colors and bright secondary colors are seen as trademarks of pop art, but this collection encompasses other prints that may not seem like obvious pop-art pieces. Jundt curator and director Paul Manoguerra says it made sense to do a pop art exhibit because of how good the objects are in the collection. One aim of the exhibit, he says, is to visually define pop art and what it means 60 years after its birth. "It draws from our shared everyday, American visual culture and elements related to consumption, materialism, sexuality, fame and rock 'n' roll. All of those aspects, and then also influences of the political turmoil of the 1960s," Manoguerra says. At its genesis, pop art appealed to people — as it still does today — because of its accessibility. The subject matter became shared visual culture. For instance, Andy Warhol's well-known use of objects in his prints like the Campbell's soup can were popular because every household, regardless of socioeconomic level, could recognize the object. In that way, it transcended barriers. Most artists focused on using elements that were recognizable and easily accessible, comprising of common colors, forms and shapes. "It's not difficult to assess in the way that abstract expressionism is difficult to embrace," Manoguerra says. 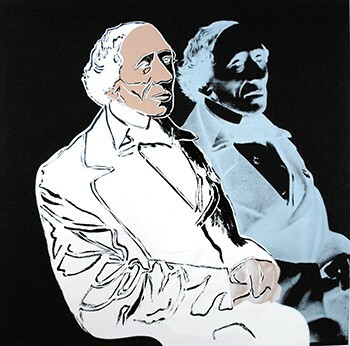 With Warhol's ghost being such a prominent presence in the realm of pop art, other important artists' names might get lost, despite their influence. As a woman and Catholic nun Corita Kent was one such unconventional artist. Her iconic works Stop the Bombing, 1967, and Manflowers, 1969, are evocative responses to the Vietnam War. Social justice was also a recurring theme for Kent. 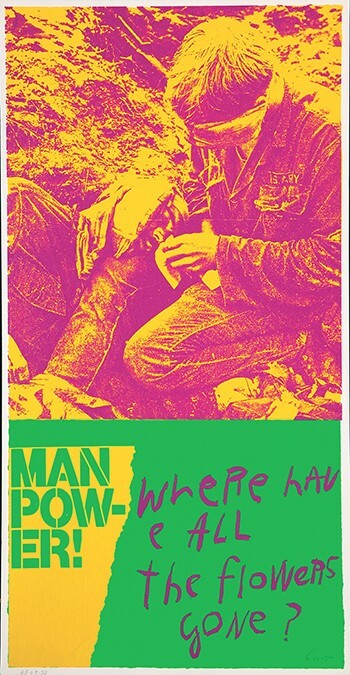 Manflowers quotes the folk song "Where Have All the Flowers Gone?" Kent uses the image of a wounded American soldier taking care of another wounded soldier above the words. "The extension of those lyrics is that you've got a young man giving flowers to a girl. He goes off to war, dies and flowers regrow," Manoguerra says. The cycle of life and war is made apparent. But aside from solemn pieces like Kent's, there are myriad bold, playful pieces, and that playfulness doesn't mean that the artists weren't serious about their work. "These artists took what they were doing very seriously," Manoguerra says. "In a postmodern way, they were just conscious of the act of creating and the meaning of what they were creating, and the audience. And so, they were playing with all of it, but taking all of that still seriously even in playfulness." Many artists were also transparent about their work, either in regards to their process or denoting a conspicuous message. In his overtly sexual print Living at the Movies, 1974, Larry Rivers gives a nod to the sexual liberation of those decades while giving the viewer a glimpse of his process. He includes the border of the image where we see the pulling of the individual colors through the screen. Rivers' intention was to embrace the process as part of the creation of the image. Contemporary artist Roger Shimomura's work quotes Warhol, but borrows the aesthetic of pop art to make a different kind of statement. Shimomura was born in the Pacific Northwest and as a toddler was confined at a Japanese internment camp in Idaho. His imagery depicts his recollection of time spent interned and makes a commentary on Asian stereotypes and the ramifications of those stereotypes. Another piece that addresses stereotypes is Mexican artist Enrique Chagoya's accordion-like strip of art — think comic book and pamphlet combined — called Abenteuer der Kannibalen Bioethnicists. It conveys relevant topics today like immigration and border patrol. One image shows a maze where on the outskirts are several horrible stereotypes of Mexican, African-American and Asian people. These stereotypes lead the viewer to the center where there is a Ku Klux Klan member, denoting the idea that stereotypes lead to that ultimate form of racism. Another page in the work pokes fun at the art world through images of various Campbell's soup cans with labels like "Curator's Liver" and "Artist's Brains." Manoguerra says there are many contemporary artists like Chagoya still working in pop art to make powerful statements. The original print version of this article was headlined "Playful and Powerful"